Hills, sea, sport, spa and nduja sausage: Calabria in a country resort! A vacation in the countryside or by the sea? An active holiday or a relaxing spa escape? A hotel or a country house? 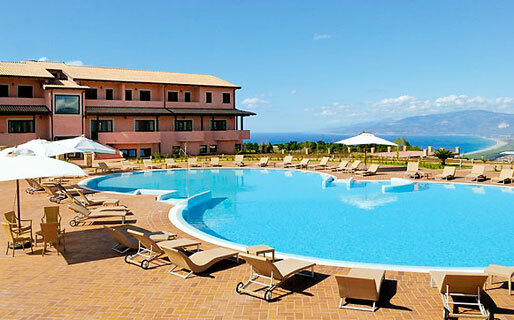 When you're in Calabria, you don't have to choose, just book the Popilia Country Resort! A hotel or a cottage? Popilia Country Resort has both! Stay in one of the resort's hotel rooms and experience the comfort of a contemporary 4 star, as well as magnificent views of the Gulf of Sant'Eufemia. If you're holidaying with the family, book one of the cottages in the resort's park and get ready to enjoy the freedom of a self-catering holiday in Calabria together with all the fantastic services offered by the resort - whenever you want. Sport, spa, sea: however you choose to spend your holiday, Popilia is the perfect place to do it. Those wishing to obtain an authentic Mediterranean tan, can soak up the sun by the resort's large swimming pool or head to the sea and the Popilia's partner beach club. Relaxing music, soft lighting and all the wellness you could want. It's only too easy to feel and look wonderful when you stay at Popilia Country Resort: just pop into the Girasole spa, where you can indulge in hydromassage baths, emotional showers, Turkish baths, Kneipp paths', every genre of massage and exclusive beauty treatments by Sothys Paris. Occupying an old colonial house, the Antica Crissa restaurant is furnished in typical Calabrian country style and dominated by a large central fireplace. The perfect introduction to the region's traditional cuisine, the menu features an excellent selection of meat and fish dishes and specialties made with the vegetables grown in the resort's kitchen garden. Tastings of typical Calabrian products, including the incredibly hot and spicy nduja sausage are organized on a request basis. Popilia is a great location in which to host a gala dinner or glamorous wedding reception. If you're in Calabria on business, the Euphemia, Golfo and Rocca halls provide the perfect venues for that all-important meeting or conference. Whether you're looking for a peaceful place to stay in the countryside or a hotel close to the sea, you'll love Popilia Country Resort : located on the top of a hill, just outside Pizzo. Want to reach the beach? The closest are only 6 kilometers away! The famous Calabrian seaside towns of Tropea and Capo Vaticano are a mere 30 minute drive from the resort. The nearest city is the vibrant Vibo Valentia. Lamezia Terme is fractionally farther afield. You can get to Aspromonte, Riace and the Ionian coast in just over an hour.